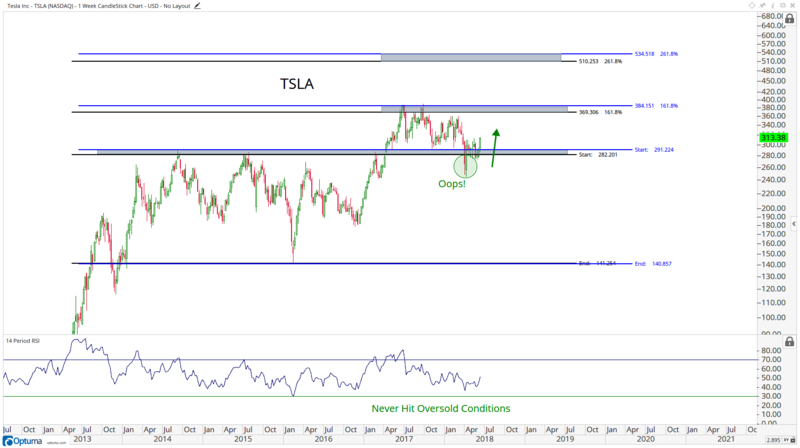 Are You Ready For A 60% Rally In Tesla? I don’t think many people are prepared for a 60% rip in shares of Tesla. I see the headlines coming through written by people who have never traded a stock in their lives. I see the pessimism and skepticism. Most importantly, I also see that a third of the float is short the stock. So forget what people are saying, look at what people are doing! Those of you who know me or have been reading the blog for a while understand the power of the failed move, or the “whipsaw” as we like to call it. The old saying is that from failed moves, come fast moves in the opposite direction. I believe this scenario is precisely what we have on our hands today in shares of Tesla. In my opinion, the risk here is much higher and the higher probability outcome is that these shorts get squeezed very hard. There are few things more exciting than short squeeze, especially when you’re on the right side of it. Alternatively, few things are worse than getting caught short during a squeeze, which is what I think is happening right now to short sellers in $TSLA. Consolidations historically tend to resolve themselves in the direction of the underlying trend. 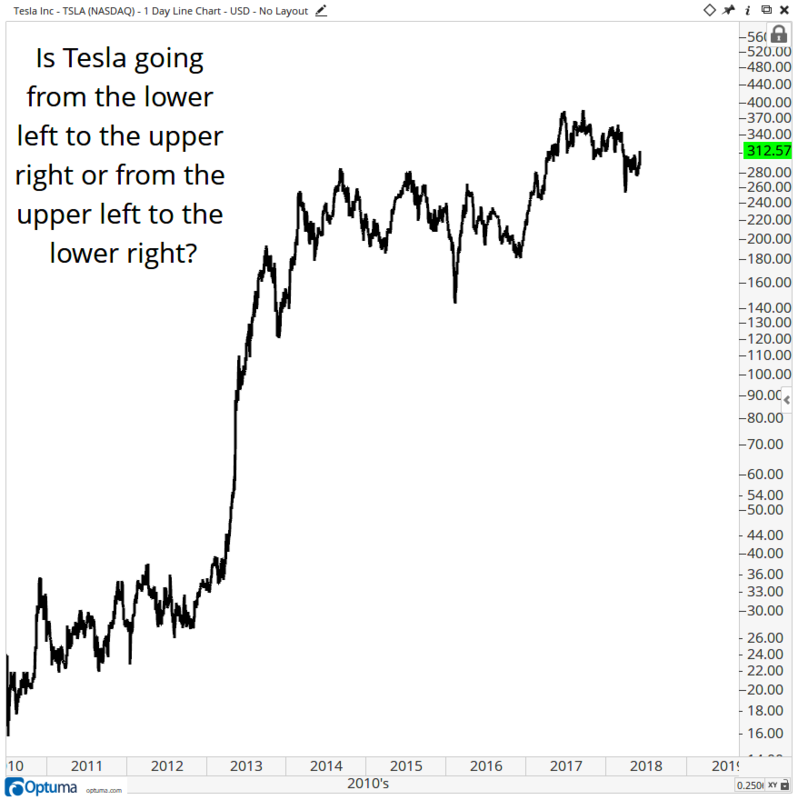 Remember that after first breaking out in 2013, $TSLA went from 40 to 195 in less than 6 months, and ultimately close to 300 by the following year. These are ridiculous returns, which obviously gets the noise makers going and of course the twitterati run amok. Nothing like prices moving to get sentiment to shift right? But then what happened? Prices had to digest those gains, which is perfectly normal. To suggest otherwise is irresponsible. Has it been a mess? Yes of course! Consolidations in trends are typically messy and lack any sort of directional trend. There is nothing abnormal about it. But of course, the noise machines around the interwebs are normally too lazy to study basic history so they have to blatantly lie and make up reasons and rumors for a lack of progress in the stock. They maliciously make noise and purposely ignore common sense at the expense of their consumers. This conflict of interest is especially apparent when a stock lacks directional trend, and therefore anything significant to talk about. Price leads news, not the other way around. So if there is not price movement, “news” becomes a way more relative term, but it needs to be sensationalized regardless. That’s just the business. So fast forward 4 years and we are still where we were in the Summer of 2014. Should we be surprised? I don’t think so. Considering the stock rallied 600% in just over a year, 4 years of digestion does not seemed too far fetched does it? The thing about support and resistance that I believe often gets lost is that these levels are not precise. Think about support like a bed mattress – it always has some give to it. Even better, when prices slightly fall below former resistance, it appears that a breakout could not hold, short sellers get excited, etc etc. Add all the noise being created by the media whose job it is to sell ads to sponsors, not to help you with your investments, and boom, you have a massive short position built by investors in $TSLA. So what happened exactly? Well prices fell below 280 and held down there for just a few days, before quickly reversing to get back above that overhead supply from 2014 and 2015. This most certainly triggered new short sellers and of course, created mass exits from the stock by the former buyers. This “failed breakdown” or “whipsaw”, is what we call that failed move that tends to spark fast moves in the opposite direction. I think if $TSLA is above 300, then this Failed Breakdown case is extremely valid and the risk vs reward is very much skewed in favor of the bulls. Typically from these scenarios, the resolution tends to go beyond the former pivot levels, which in this case are around 370. So I believe we break out through that level and rally towards 500. Are you not already a Premium Member of Allstarcharts? Email me and tell us why not. A better idea is to start a 30 day risk Free trial today. What do you have to lose?